Weather forecasters called for scattered rain in Los Angeles on Saturday afternoon. However, that didn’t stop people from attending the seventh annual Ska Wars. 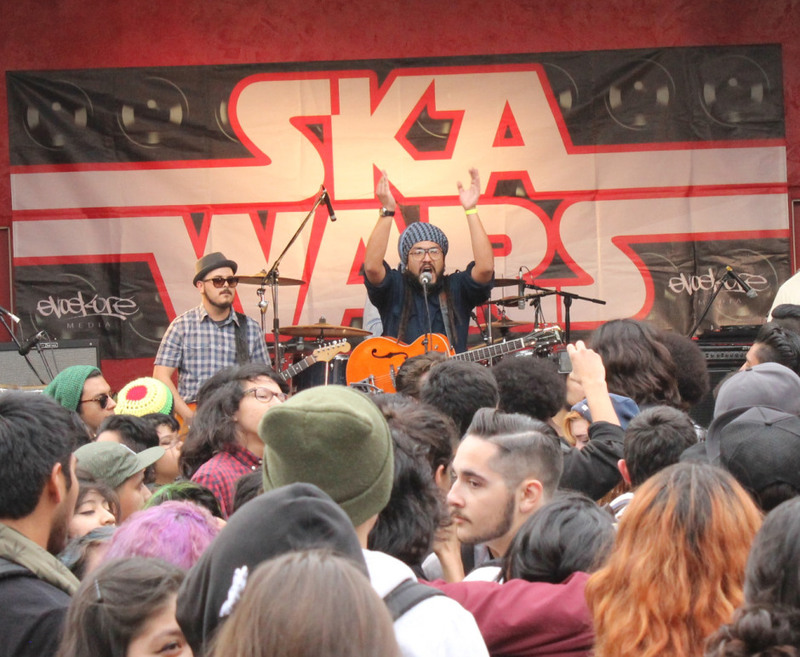 Hosted by Evoekore, Ska Wars was held in Plaza De La Raza in Lincoln Park. Twenty-four bands joined together from all over Los Angeles, music ranging from reggae to punk, and sung their hearts out on stage. Crowds started off scattered when the show started at 1 p.m. and only grew as the night went on. Each of the two outdoor stages (Ska Wars on the main stage and Voice Corner on a smaller one) had their own genre. The main stage consisted of mostly ska while the voice corner played punk. People could take a short walk to the stage between sets or pick and choose which band they wanted to watch more. Either way, there was always the roars of a mosh pit and bumping of a speaker. From those speakers came trombones, trumpets and guitars which were the most used instruments at the event, however, each band used those instruments in a different way. The Toasters, who have been together for more than 30 years, used their brass instruments to create a jumping beat. No Morals used theirs to create something more related to punk. Either way people danced, laughed and screamed while listening to their favorite set. It got most intense when more well-known bands like Matamoska and Inspectors got on stage. Although tickets were raised from $18 last year to $24 this year, the ska scene has become much more popular among underground shows, allowing for more people to bond and bands to meet others with the same music interests. Elotes, tacos and even enchiladas, filled the atmosphere with spices rather than cigarettes. Fans could eat in the patches of grass or pillars near stages. Besides food and drinks, people could buy patches, pins, shirts and posters of their favorite bands from the event. There were also outside band merchandise such as The Smiths and Korn. Many bands, like 23 Skunks, held giveaways and threw a few free shirts into the audience. Once the sun set, people became more comfortable and loose, leaving the opportunity for a bigger crowd in front of the main stage. A few beach balls were even let out into the crowd. With the last set beginning around 10 p.m. the event had no clear end time, therefore crowds filled the park around the plaza. Some continued the hype with after parties or just going to a nearby restaurant. Overall, the event filled hearts and spirits with its mix or music and diversity. “I’ve never felt an atmosphere as strong as this one. I will most definitely come back next year,” Vargas said.